Currently, I think I have around nine messenger installed on my smartphone alone, not included apps that could technically also be considered messengers – like Snapchat or Twitter. On my laptop it’s pretty much the same picture. Hence, I always wanted one messenger – to rule them all. Well, not exactly. One messenger would mean a monopoly*, which, for the sake of security, control and user experience, I simply would prefer to avoid. But the internet of Facebook and Google might get us there. Anyway, switching between different messengers is a pain in the back. 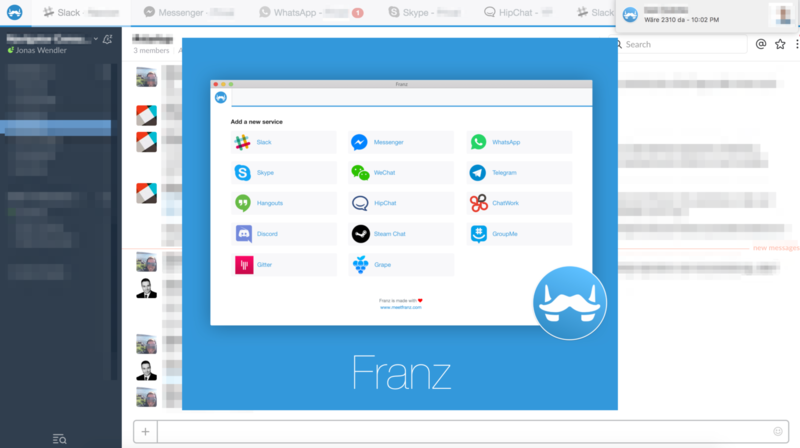 A while back I stumbled upon Franz, an application that combines different messenger services. Pretty much what I am looking for. I am using Franz every day at work and at home now and I never had any real issues. The app currently supports WhatsApp, Facebook’s Messenger, the secure messenger Telegram, Google Hangouts, Skype, and the (hipster) work messengers Slack and HipChat. For those of you that are not located in Europe or have friends from abroad, it also supports more ‘exotic’ apps like WeChat. Pretty decent, I would say. Franz pretty much just puts your messenger’s web application into an app, but that’s fine with me. It works more or less seamlessly, except for the occasional re-entry of login information. The app further allows to modify notification settings for every service integrated. Franz is, thus far, available for Mac, Linux, and Windows 7 upwards. Hence, coming back to my smartphone example, the app does not help in that case (yet). It would be cool to have something similar – that is actually working – for Android and iOS. Also, the team could add more services like Threema or Line. In essence, the only thing I can complain about is not having the app on more operating systems with more services integrated. First world problems, I guess. I did not encounter any major issues. If I encounter some bugs, I’ll update this post. Please let me know if I missed something as well. Transparency: I am not in any way sponsored or affiliated with the creators of Franz. This blog post is as objective as it can be. *I am well aware that some folks (e.g. Peter Thiel) think a Monopoly is a good thing, but outside of the ‘Silicon Vallye’ bubble, it maybe isn’t such a marvelous idea.